One important aspect in film making is putting together the mise-en-scene. “Mise-en-scene includes those aspects of film that overlap with the art of the theater: setting, lighting, costume, and the behavior of the figures.” (Bordwell & Thompson, 2010). Comedic directors and producers use different elements of mise-en-scene to exaggerate certain things in the scene. One type of comedy, the drama comedy, is a comedy that has funny moments as well as more serious, dramatic moments. In particular, the movie 50/50 uses different elements of mise-en-scene to help seek different effects on the audience. One element of mise-en-scene is the lighting. According to Boone, “As Jean Rosenthal described the narrow, formulaic conventions of lighting that dominated the theatrical stage as late as the 1930s, ‘Comedies were bright; dramas were uncheerful. Day was yellow; night blue.” (Boone, 1997). Therefore, in the most basic form, comedies would have bright light and dramas would have a darker ambiance to them. 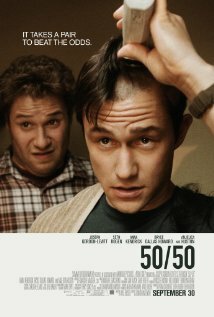 In 50/50, the story shows Joseph Gordon-Levitt and Seth Rogan as two friends who are just living the basic life. As the story progresses, the audience finds out that Joseph Gordon-Levitt’s character, Adam, has cancer. Before the audience discovers this, the lighting is bright and cheerful. Once Adam gets cancer, we see his whole life somewhat fall apart. He finds out his girlfriend has been cheating on him, and we suddenly see the lighting change. In one scene in particular, we see Adam lying in his bed with all of the drapes closed and there is darker lighting. This helps us as an audience start to switch moods from humorous to serious. As previously mentioned, another element of mise-en-scene is the behavior of the characters. In the beginning, the characters behave just as two best friends talking about girls and their jobs. There are also many comedic lines throughout the beginning of the film. As the story progresses, we see a change on how the characters are acting, especially the way Kyle, Seth Rogan’s character, begins to treat Adam. At first, Kyle has no doubt that Adam is going to survive and doesn’t seem too worried about his friend. However, once Adam is about to get surgery, there’s a scene in the car when Kyle is no longer making jokes. We see his character’s mood become much more serious and as an audience our perception of the seriousness of the situation intensifies. This helps the audience balance the comedic element to the movie with the serious story background. Similarly, throughout the entire film, the behavior of the characters helps the audience balance the comedy with the drama. For example, even after Adam is diagnosed with cancer we still see humorous parts when Kyle takes Adam out to try and meet girls. We are reminded of their humorous friendship in spite of the disease that is now in their life. One example is when they are shaving his head. Instead of remaining completely serious as a drama without comedy would do, they implement funny lines. Kyle is making fun of Adam because of the shape of his head, and while some may feel that as insensitive, it reinforces the natural humorous elements that occur between friends. Then, even immediately after funny parts, Adam will start to feel sick and we are once again reminded of how real life drama is present in the film. When Adam is about to go into surgery, we get a sense of chaos throughout the characters. “The causal, sometimes chaotic mise-en-scene creates a strong sense of spontaneity.” (Neupert, 2011). Before now, Adam has remained pretty calm under the circumstances. Many other people in his position would have felt self-pity or broken down before now. Since his character has not shown any of these immediate emotions we might expect him to feel, we do not view him as a completely emotional character. With the music in the background, we feel a sense of urgency and chaos before his surgery. The actuality of the situation starts to reside in Adam, and we as the audience begin to feel that too. Spontaneously, he starts crying and hugs his mom and once again this helps us to see the drama in the comedy. One element of mise-en-scene is the setting. Richard Abel who has done research on mise-en-scene infers that some film makers will use an idea of ‘deep focus’. This basically means to integrate different planes of the film; middle ground, fore ground, and background; and to use them with one another instead of against one another. (Abel, 1975). For example, the scene when Adam is first diagnosed with cancer is when we first start to see some of dramatic elements in the film. At first, he is making witty comments about being sick and taking it lightly. The visual image of the doctor would be considered the foreground of the situation. Suddenly, when the reality starts to set in, we are drawn into Adam’s mind as background music begins to play and the doctor’s voice drowns out. After this happens, Adam’s face and thoughts really become the foreground and the doctor explaining the options because the background. By integrating these two elements in the scene the film makers help us to transfer from the comedic mood to the dramatic mood. In conclusion, mise-en-scene can be used to help an audience perceive certain situations in a certain way. In a comedic drama, such as 50/50, it is very important to do this successfully so the message of the film is accepted correctly. If the film maker does not use mise-en-scene correctly in a comedic drama they are at risk of offending many people. This film did excellent ways of portraying something as serious as cancer in a more humorous, realistic light. The integration of setting, lighting, and behavioral of characters helps us as audience successfully switch moods when it is appropriate. Bordwell, D. & Thompson, K. (2010). Film Art: An Introduction. New York: McGraw Hill. Boone, M.C. (1997). Jean Rosenthal’s Light: Making Visible the Magician. Theatre Topics, no. 7.1. Retrieved from http://muse.jhu.edu/journals/theatre_topics/v007/7.1boone.html. Abel, R. (1975). Collapsing Columns Mise-en-scene in Boudu. Jump Cut: A Review of Contemporary Media, no. 5. Retrieved from http://www.ejumpcut.org/archive/onlinessays/JC05folder/MiseSceneBoudu.html.